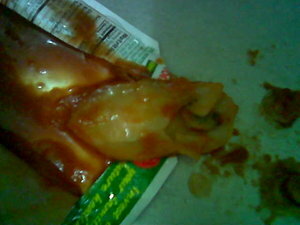 Just another HORRIFYING thing about the said pasta sauce.. READ so that you'll be aware..
Gertz (3/25/2009 9:33:12 PM): Preti! 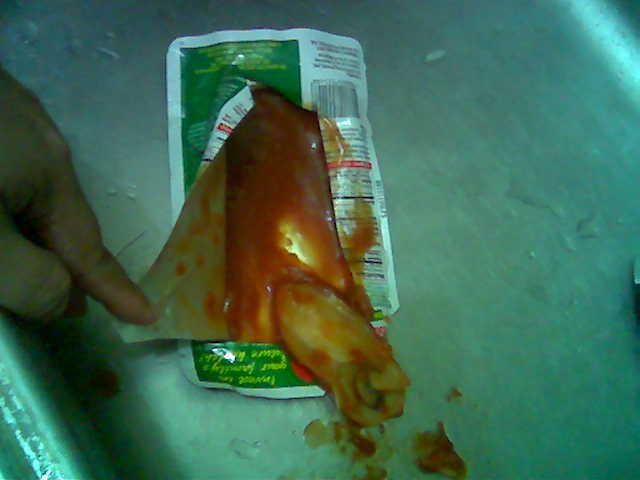 Gertz (3/25/2009 9:33:36 PM): Me nakita akong parang pusit s loob ng pouch ng delmonte tomato sauce!! Gertz (3/25/2009 9:34:30 PM): Dati me ng email n s kin n me daga ang delmonte sauce pero dis 1 prang pusit n ewan eh! Gertz (3/25/2009 9:34:38 PM): Syang luto ko n mechado! Gertz (3/25/2009 9:45:59 PM): Kadiriii! Want to see the pictures? It looks like a squid but it could not be! Because tomato sauces could not have a squid inside the pack, right? The said item was bought in PureGold Imus and Gertee said she could have bought hers in SM Molino ---- wahhhhhh same batch siguro to!!! Puregold is only a few kilometers away from SM Molino! Mr. Bautista got the heart of the rat and Gertee probably received the body...eeeeewwwwww! OMG! del monte user pa naman kami ever since! jusme!!!! Yup... These things should be made public... Pagkain yan.... Delikado if we are not careful. thanks for posting G, we're going to elevate this concern to the media if we don't receive a reply from DM tomorrow. yes sis.. il post din sa blog ko.. para nman malaman nila kung anu tlaga nangyayari..
delmonte pa naman din kami lagi..eww...gross..
eeeewwww! it's so kadiri naman. they should complain about this! Shaks. Sa sm molino pa naman ako nggogrocery! Wah. OMG! kadiri nman! people must know this.. yucky!!! del monte should be sued for this!! clara ole na lang ako! SORRY.. i have to delete that blog.. hehehe pasted all the comments entered there..
buti na lang heinz gamit ko. kaloka! ewwww....kadiri! ano ito?...paano nalang iyong mga spaghetti sauces ng delmonte? have mercy!!! !